Unilab Nutritionals launched Athena, the country’s first and only milk brand that understands women. The launch introduced Athena’s triad of benefits, a first in the Philippines, which was held on November 26, 2010 in the Grand Ballroom of New World Renaissance Hotel. This event was hosted by Bianca Valero. 1. Beautiful Skin. Athena provides anti-oxidants (Vitamin A, E & Zinc) to help women’s skin become healthier and more beautiful. 2. Strong Bones. 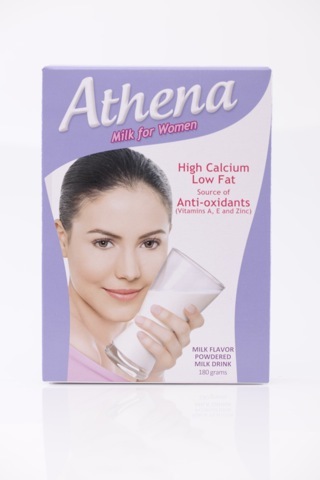 Athena is high in calcium to help strengthen women’s bones. 3. Slim Figure. Athena is low in fat to help women maintain a slimmer figure. Bianca Araneta-Elizalde was introduced as Athena’s endorser for the way she has been able to successfully manage the different aspects of her life. Amid her various roles as model, TV host, entrepreneur, environmentalist and philanthropist, she still has time to be hands-on mother to two children and a caring wife to Juan Elizalde. She believes that Athena is the milk that perfectly complements her lifestyle. Bianca Valero also introduced three brand influencers that represent, through the active lives they lead, Athena’s triad of benefits: Lia Cruz who embodied strength through her career as a TV host, Sandra Seifert who embodied body as an active health buff, and Rissa Mananquil who embodied beauty through her successful international modeling career and fashion icon status. Each of them shared about how they were able to successfully manage their busy schedules while still finding time to do the things they love to do. Athena is available in leading supermarkets, groceries and drugstores nationwide.